FotoFocus 2018 promised, in its thematic title, to burrow into the archives, and at the CAC, they uncovered something. 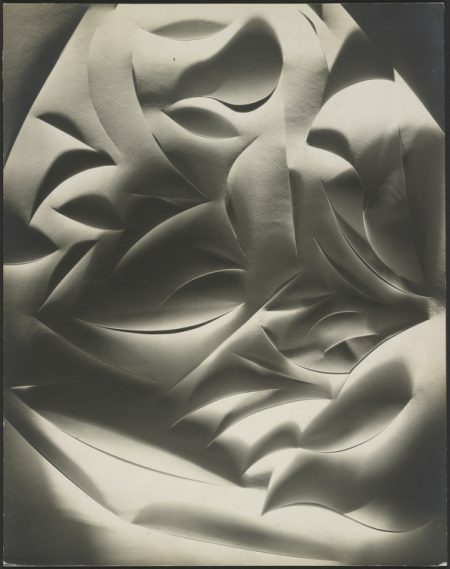 The roots of its show, “No Two Alike,” go back to an artistic event of mid- to high-Modernism, when, in 1929, a small London gallery belonging to Dorothy Warren brought together the photographs of Karl Blossfeldt and Francis Bruguiere. 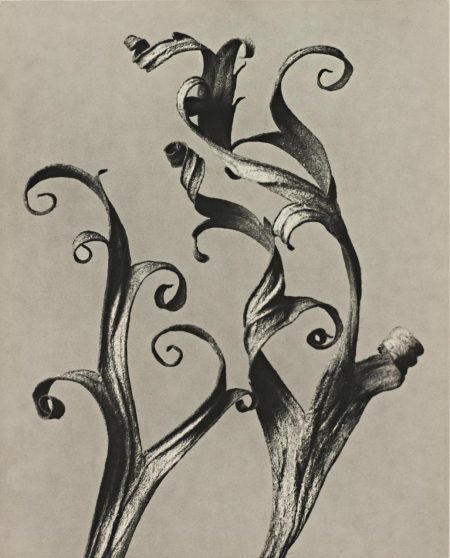 Blossfeldt had been making ultra-close-up pictures of parts of plants and flowers since the 1890s, but was only publishing them—and coming to the attention of the fine arts world—in the late 1920s. Francis Bruguiere was a San Francisco-born bohemian who took moved to New York in the first decade of the 20th century and took up photography under the influence of Stieglitz. He worked as a commercial and theater photographer but was soon experimenting with abstraction. In 1928 he moved to London where he began his series of cut-paper abstractions that formed the center of his show in 1929 and then ninety years later at the CAC. On some intuition, Dorothy Warren thought that these two substantially different photographers and sensibilities would look good together, and on some intuition, CAC Guest Curator Ulrike Meyer Stump reconstituted as much of that show as possible, and then added the closely-related and impossibly different work of the highly eclectic contemporary German photographer Thomas Ruff to the mix. Ruff—whose work is worth seeing under any circumstance—earned his way into the show partly because of a small-scale series called “Negatives” that includes images by Blossfeldt which Ruff has printed in reverse in cyan. Ruff is also at the CAC because of his huge-scale works called “Photograms,” though they are, in fact, virtual rather than actual photograms. The CAC show suggests that Ruff’s works are in conversation with Bruguiere’s cut-paper abstractions, though Bruguiere’s photographs are actually even further from being photograms than Ruff’s are. But the work of all three has both deep and clever connections to photography’s ability to capture and transform sculptural forms, and certainly share photography’s relentless interest in the relationship between three-dimensional artifacts and two-dimensional images. Blossfeldt’s showing at the Warren Gallery was itself a sort of migration from the archives. Though only a dozen or so years older than Bruguiere, Blossfeldt belongs to a much earlier photographic world. His roots are in scientific and documentary photography that found its way towards higher art through the faithful capture of external reality, whether the pyramids of Egypt or the mosses of England. This is the sort of work that has greatly enriched the photography collections of older museums by being reallocated from the library shelves to the gallery walls. Blossfeldt probably saw Nature itself as a sort of archive, and went to it for the intricacies of the buds, the suggestiveness of the stems, the startling patterns of the leaves, all with the intense interest and steady eye of the botanist. He preferred the commonplace to the exotic—stripped of their Latin names, he photographed field horsetails, rosinweeds, yarrow, big-headed knapweed, birthwort, daisies of various sorts, bear’s breech, monks hood. He was the Atget of weeds. Like Atget’s systematic records of ordinary Paris alleys, Blossfeldt’s botanical specimens raise significant questions about the subject matter for photography, a position that might be equally shared by the scientific eye and the sensibility of the archivist. Does subject matter matter? Will anything do? Blossfeldt was not an encyclopediste. However many photographs he may have taken over the decades, he published only120 in his book, and when the book went to a subsequent edition, he just reprinted those same pictures again. Some of the specimens seem to be held up as examples of Nature operating on a wholly functional basis, such as the winter horsetail; though it might pass for a vision of a tower in a city of the future, its main concern seems to be from where on a stem will a new bud or branch come. Blossfeldt’s work overlapped with the years of the Bauhaus, and he may have shared their view that beauty arose from functionality. In the coolness of their appraisal of natural form, sometimes his pictures look like mug shots. The great majority of the pictures shown at the CAC are of plants taken against blank or empty space; very few are softened by a closer backdrop that might produce shadows, though interestingly, those tend to be the Blossfeldt images that Ruff turned to for his “Negative” series. But others of Blossfeldt’s pictures celebrate Nature’s sheer extravagance. The lines of his “Cucurbita”—a pumpkin vine–twist and turn around each other into absurd spirals and knots. Whatever it is, it is not economical. Karl Blossfeldt, Delphinium, before 1928. Blossfeldt—perhaps again like Ruff—is deeply conscious of the history of the representation of his chosen forms and shapes. Though his work must in some ways be in conversation with the conventions of the herbalist tradition, some of his images go back even further, to the artistic conventions of the later gothic. Blossfeldt’s “Delphinium” is a tracery of sharp twists with stiff but wavy curls of the sort you might see in a 15th century engraving to represent the leaves of a tree or the hair of a lover. Without chiaroscuro, there is something a little rigid and unforgiving about the shapes. It is startling to see how exacting and yet graceful the geometries of his specimens can be. The highly elaborate but symmetrical “Saxifrage” could decorate the end of a cathedral pew or appear at the top of an archbishop’s crozier. 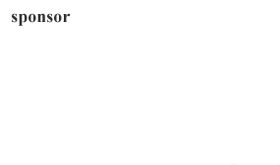 It already is a generalization of itself. 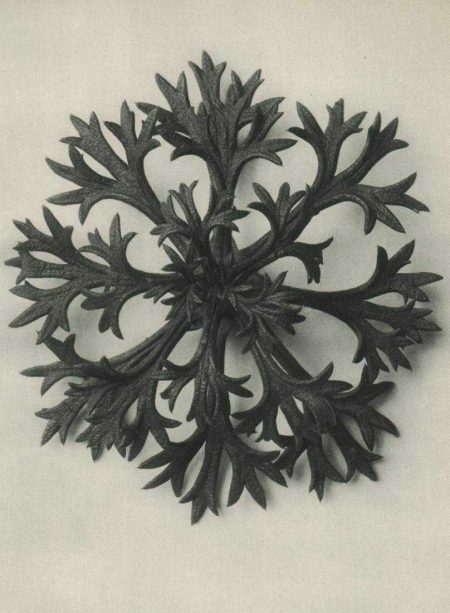 Blossfeldt’s academic field was “applied art”—a difficult line of work to parse nowadays, but probably closely related to the spirit behind the creation of the Victoria and Albert Museum and, for that matter, the Cincinnati Art Museum. It is probably fair to say that Blossfledt would have seen the function of his photographs as capturing Nature’s artistic potential without necessarily insisting that his own photographs were truly art. Karl Blossfeldt, Saxifrage Wilkommiana, before 1928. But that changed with the 1929 exhibit that gave the CAC show its impetus. 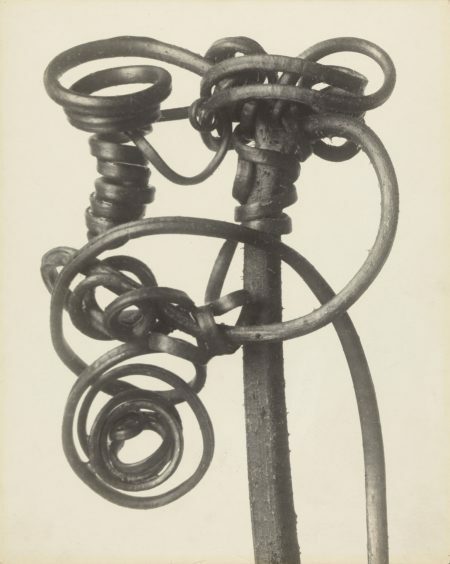 By linking him with Bruguiere, whose pictorial interests were in the deliberate creation of abstraction, Warren helped change the terms of Blossfeldt’s work. In the company of Bruguiere, Blossfeldt’s work now could be nothing but fine art. 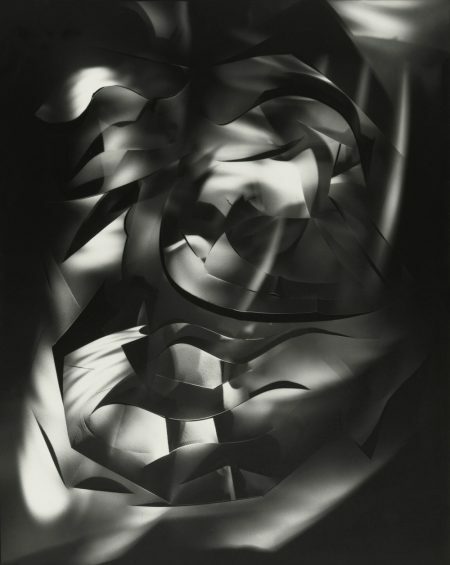 Bruguiere’s photographs consist of cut, folded, and twisted paper that he photographed by the harsh glare of a single 250-watt spotlight. Then he moved the light source—but not the form—and re-exposed it. The result is not merely dramatic, though it surely is that, too. It is hard to say how many times he re-photographed his shapes for any single picture, but the layered result is a form that has become a physical improbability. Our eyes and brains make sense of shapes by how light strikes them and creates highlights and shadows. Not these. Bruguiere’s photographic roots are with Stieglitz’s Photo-Secessionists. He gives us highly-detailed, well-crafted pictures of things that cannot exist in the world, abstractions that work by disorienting us. If he moves the light source often enough, we lose our sense of what is up and what is down, and can find ourselves in a world without gravity, which can be visually thrilling. It is as if we could experience a roller coaster and a desktop-sized model for an epic sculpture at the same time. Francis Bruguiere, Cut-paper Abstraction, about 1928. Bruguiere is a maker of artificial realities, fulfilling what Sir Philip Sidney argued a half-millennium ago was the artist’s true function: to make a second world. His pictures record imaginary architectures, though it’s hard to say what we are to understand as their scale. Though they seem like miniatures—sometimes almost sketches or maquettes for larger structures to be made out of more durable materials—they also seem to be about spaces that the viewer could inhabit. Perhaps it’s due to his training in photographing sets for plays, but some of his pieces seem to suggest the presence of pathways or arches or tunnels through which humans might pass. Or flee: the lighting effects sometimes presage an oppressive film noir landscape bounded by the possibility of narrow and uncertain ways in or out. Interestingly, these are among the few works in the whole CAC show to even suggest narrative content—or, for that matter, human spaces. It is true that Bruguiere’s work includes figurative photographs, but I found them far less interesting than the abstractions. Modernism proposed a great many ways to represent (and deconstruct) the human element in art, and Bruguiere’s did not seem to me to be among the more powerful or the most interesting. Francis Brugiere, Cut-paper Abstraction, about 1928. 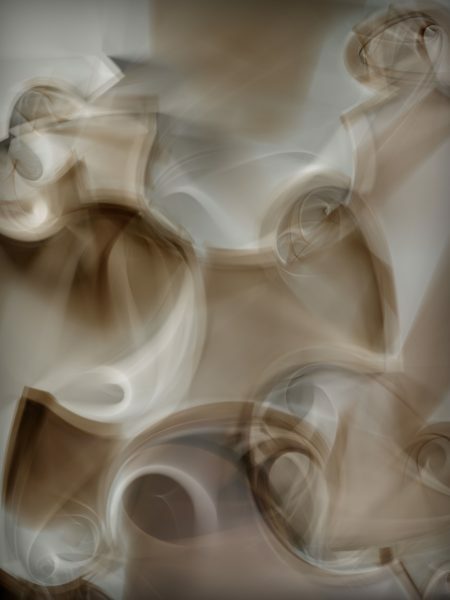 If art is about creating dreamscapes, Thomas Ruff’s work might be more tightly connected to Bruguiere than initially appears. 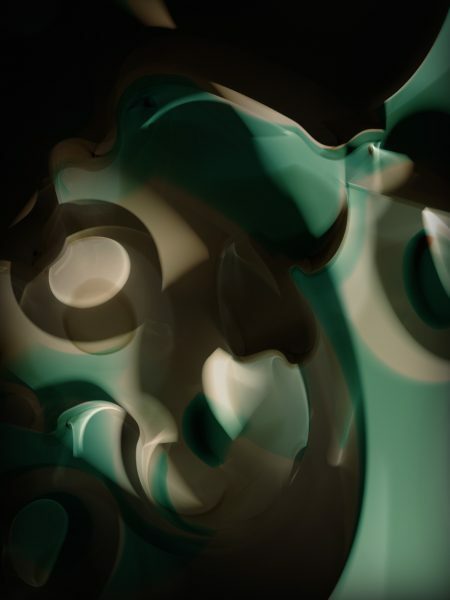 By far Ruff’s most riveting works in the show are his artificial photograms. An actual photogram typically consists of an image created by placing two or three dimensional objects on photo-sensitive paper and directly exposing them to light. The objects leave shadows in white (they are developed like a photo-negative) that can be skewed by moving the light source, or angling the objects or suspending things at different heights from the paper or by any of a variety of other ways of leaving traces. Ruff works on the same principles—only there are no objects and no sources of light: the encounter between thing and light is entirely computer generated. As the catalogue essay notes, “He places virtual—sometimes transparent—objects on artificial paper, illuminates them with virtual light sources, and adds color.” The results are as varied as a work that looks like an Art Deco travel poster or one that looks like a range of small objects have been hidden underneath a satin bedsheet. As Ruff commented in an interview with Aperture magazine (Summer 2013), with photograms “you can’t recognize things very clearly, but you recognize something.” It would be fair to say that these too are artificial worlds, featuring things that are, literally, nothing. Thomas Ruff, r.phg.10, 2014. Chromogenic print, 94 1/8 x 72 1/2 x 2 3/4 inches. (c) Thomas Ruff. Courtesy David Zwirner, New York/London/Hong Kong. (c) 2018 Artists Rights Society (ARS), New York/VG Bild-Kunst, Bonn. Some of Ruff’s pieces look more or less like conventional photograms, such as “phg.03” (2012), which looks like a coiled spring that has left its shadow behind. In photograms, the artist draws with shadows—Ruff compares them to Plato’s allegory of the cave—and leaves a few bright spots, the translated form of the shadow, surrounded by a pitch black world. The photogram, pretty much a rigidly black and white form, makes one miss the tonal world of Blossfeldt where Nature seems to have drawn in gentler shades of grey. Unlike most conventional photographs, a photogram is the image of the things that are no longer there; objects in photograms are just passing through. They are collages of absences. But Ruff must have felt that the pure imitation of the photogram was too limiting, even if he could sneak in some somber color. In 2013 and 2014, his photograms burst into full color. Some share with Bruguiere’s work a sense that the “objects” created defy gravity; the black spaces of the photogram—now a decision, rather than a necessity of the form—have never been more lyric, as in “r.phg.10” (2014). The photograph is filled with swirls and shapes and sensualities. It might be something one could see in a magical still life. In some ways, these works follow the conventions of painting as much as they do of photographs. They are beautiful and clever and, at first blush, seem not to have noticed all the ways modernism has worked to flatten the surface of the two-dimensional work, instead emphasizing rich chiaroscuro and a practically perspectival recession of space. Except, of course, there was no actual space there to capture or see recede. Thomas Ruff, r.phg.07_11, 2014. Chromogenic print, 100 3/8 x 72 7/8 inches. (c) Thomas Ruff. Courtesy David Zwirner, New York/London/Hong Kong. (c) 2018 Artists Rights Society (ARS), New York/VG Bild-Kunst, Bonn. And this thing is huge. At eight feet by six feet, it is probably by itself as large as all the Blossfeldts and all the Bruguieres in the show put together. Though Ruff often likes to work large, the scale of the photograms is particularly audacious in the context of this show. Blossfeldt’s work, though published at less than a foot tall on the longest size, are remarkable for being such a substantial enlargement of their original field specimen subject matter. Bruguiere’s works are typically about the same size as Blossfeldt’s, but often give the impression of having shrunk a larger subject matter down to a miniature of itself. Ruff’s photograms are literally larger than life and take your breath away. It made me wonder what works by either Blossfeldt or Bruguiere might have looked like that size, had either artist wanted to and had the technology permitted. Thomas Ruff, neg_stil_06, 2015. Chromogenic print, 11 5/8 x 8 7/8 inches. (c) Thomas Ruff. Courtesy David Zwirner, New York/London/Hong Kong. (c) 2018 Artists Rights Society (ARS), New York/VG Bild-Kunst, Bonn. Interestingly, when Ruff came to do his adaptations of Blossfeldt’s work as part of the series he called “Negatives,” he did not go large. Barely longer and wider than the originals, they are eerily sharp—and, because the color scheme is reversed (they are, after all, homages to the lost intermediary of the photographic negative), seem unfamiliar. The richly patterned surfaces of the plants seem to be not made of earthly stuff anymore. They appear more like electron microscope images than photographs of things that have been enlarged a mere thirty times. They are peaceful and strange. Ruff has kept their forms but changed the light. Where Blossfeldt’s images have a deliberately regimented lack of contrast, the contrast in Ruff’s versions is increased, and the objects seem to glow. The fresh gothic linearity of the Blossfeldt images seems to be downplayed. But in so many ways, art from Fauvism on has taught us that color is arbitrary, and never more than when it is wholly digital. 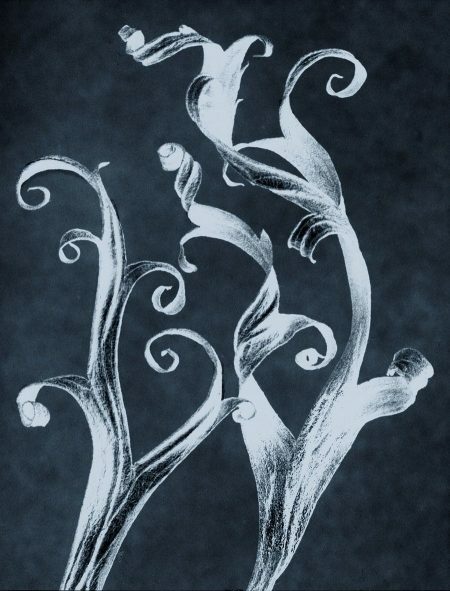 Blossfeldt’s earthly specimens have been transformed into something unearthly. Alternate and unnatural worlds are just that close.